Disclosure: This is a sponsored post written by me on behalf of SoCozy. All opinions are my own and not edited by the sponsor. If you've been tracking us Lovebirds on our Instagram Stories the past couple weeks you've been seeing all of our spring break adventures and with the sun coming out slowly but surely here in Boston we're excited for it to warm up! This definitely means more frequent baths are in order and just like his big sister while Grayson absolutely loves bath time, getting his hair washed can be hit or miss. As a fellow tender-headed member of the family, Grayson and I were thrilled to learn about the launch of their new collection called HUSH, which is dermatologist and allergy test to treat sensitive scalp. Now available at Target we picked up the the Sensitive 2in1 Soothing Shampoo+Conditioner and the Sensitive Scalp Serum. 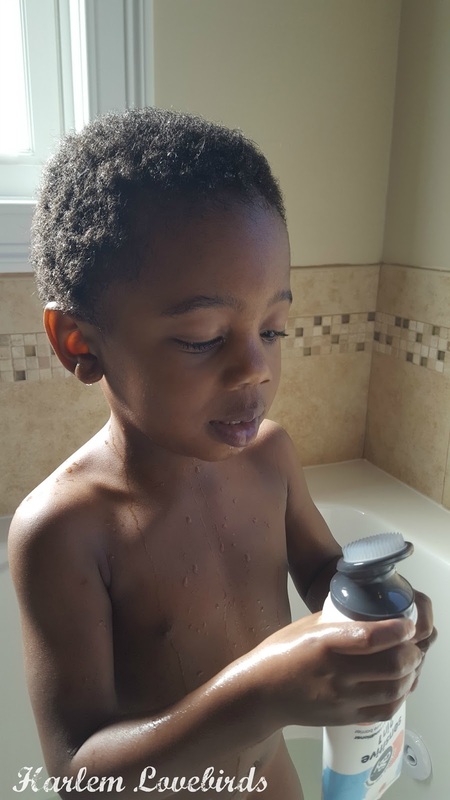 Both have "No Nasties" as indicated on the packaging, which translates into being non-toxic and free of parabens, sulfates, phthalates, formaldehyde, synthetic color, propolene glycol, gluten, wheat and nuts - those last 3 quite important cause as we all know, kids do eat toiletries from time to time (I did as a kid!). I love how the shampoo has a built-in scrub brush to help the shampoo go much farther, giving a gentle massage to the scalp. As a bonus, with Grayson's tight curls like mine, I liked how the brush helped soften and loosen them up, making his hair easier to style afterwards. Grayson sat surprisingly still while I washed his hair - I think it's because the brush felt so good on his little head! 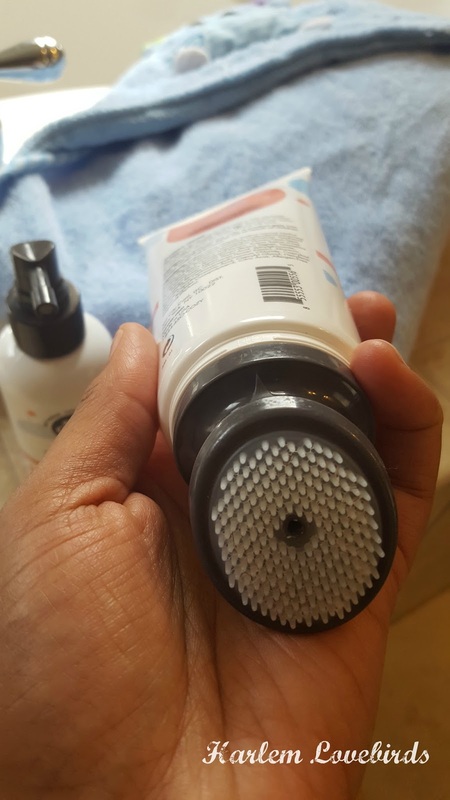 Next, we tried the Sensitive Scalp Serum - I liked that it didn't have a strong smell as I've experienced with other scalp-specific products. As I have discoid lupus I gave it a try too on my scalp since it can get inflamed at times. It felt really good as I massaged it in and Grayson like it too saying "more, more more." 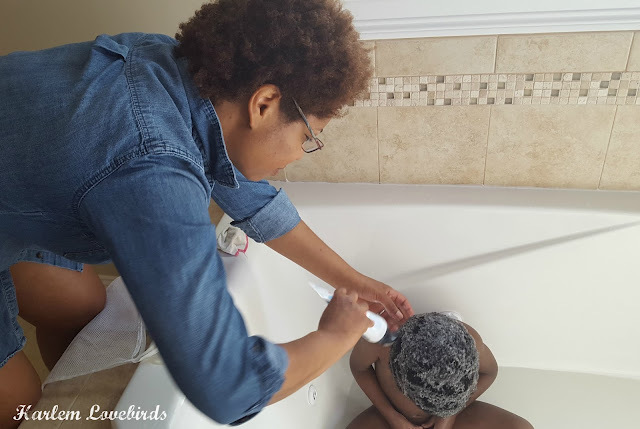 Nia even used some in-between her cornrows to help sooth the itch they get from time to time. 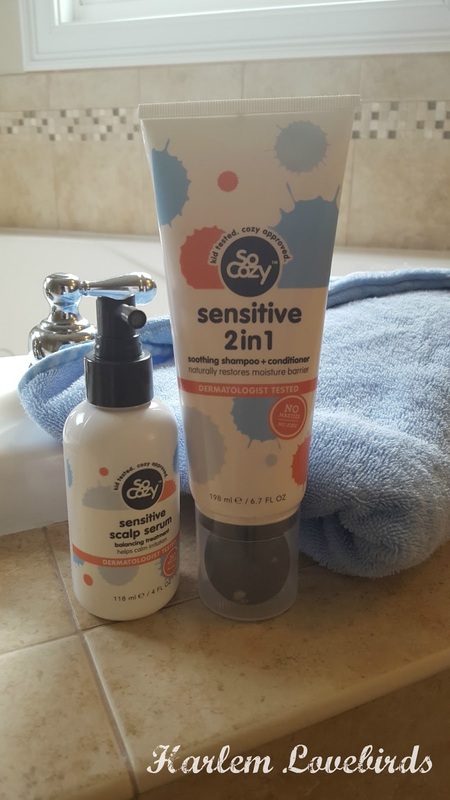 Target also carries the HUSH Sensitive Foam and Detangler, with all of the SoCozy product line found in the baby aisle - it's good enough for the entire family to use though! What's bathtime like in your house? Do your kids like getting their hair washed too?